Saw this and couldn't resist giving it a try, here's the famous "enemy hall" before the grim reaper. 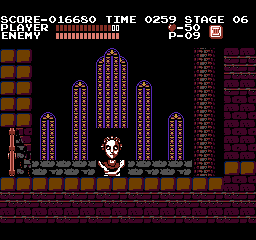 Looking for some thoughts and critiques though, I tried a purple curtain version to free up the HUD palette, but I think the red curtains are an iconic callback to the original. 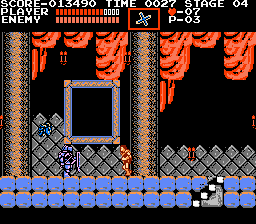 As a cool twist, the glowing eyes on the 'Bona Lisa' would kick in as you approach, using an 8x8 sprite to animate. This is such an awesome idea! and you all have made some pretty amazing looking mockups so far. Here's my attempt. 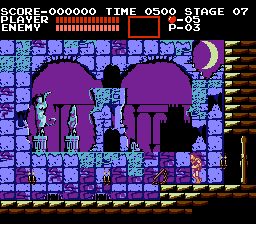 I've tried to keep it close to the original, but colorwise gone nuts with a more purple look except for the foreground, which was painting yellow/brown as if the bricks were being highlighted by the light of the moon. 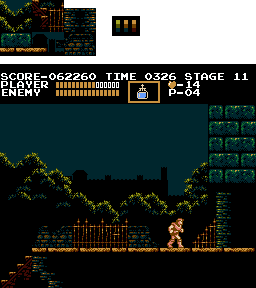 I also tried to get a more ruined look, as well as more foliage in the background. 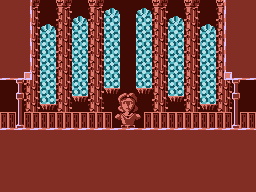 This more or less started with an idea for a palette cycling animation. I hadn't taken the 16*16 areas rule fully into account, so I discovered halfway through assembling the animation that I didn't align the windows right and that they wouldn't work in this setup at uniform length anyway. Not without having to remove the window frames. 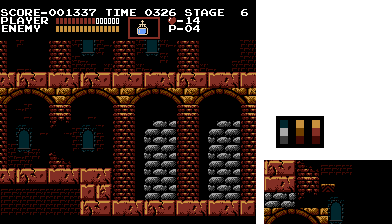 This requires three out of four palettes, so the rest of the room had to be monochrome. I got a bit lazy with the foreground. The doors look rather poor to me now as well. I haven't made a animation going from the static version to the cycling, although I have one planned. The head wouldn't be around anymore during the animation in-game. 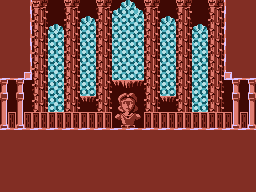 Before I fix anything or work on the forground though, I'd like to know if the cycling and colour choice looks good. Other comments are welcome as well. This version should obey restrictions. 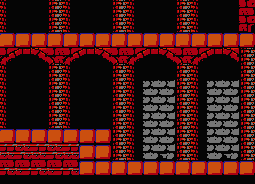 Also messed with some tiles. I guess the doors are pillars now. and the second is more or less freestyle. 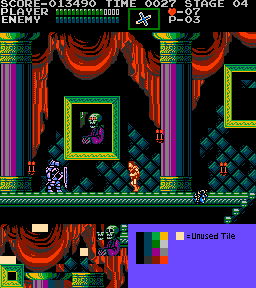 I hope I didn't screwed up the 16x16 color areas too hard. 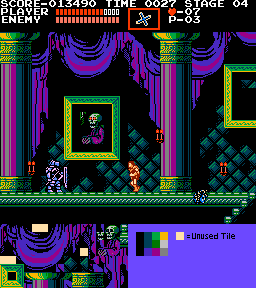 It's really incredible what can be done already with so few tiles.